The George W. Bush Institute (GWBI) hosted a national summit Feb. 18 in Dallas of nearly 450 leaders in the veterans services landscape, including heads of government agencies, major foundations, corporate funders, nonprofit organizations and think tanks, as well as veterans themselves. This second national summit hosted by the Bush Institute’s Military Service Initiative (MSI) caps off a yearlong research project conducted by the MSI and the Institute for Veterans and Military Families (IVMF) studying leading practices in veteran-serving nonprofit organizations. 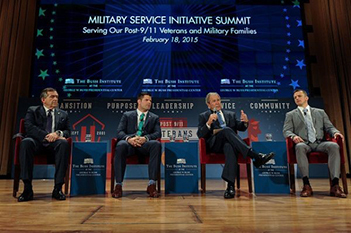 Former U.S. President George W. Bush, second from right, attended the national summit of 450 leaders in the veterans services landscape. Beginning early last spring, IVMF and GWBI partnered to identify 25 nonprofit organizations across the country representing a broad array of veterans’ service providers—housing, employment, education, wellness, financial assistance, wraparound services, etc.—focused both nationally and locally. This mix of organizations, young and old, large and small, focused on post-9/11 veterans and on all generations of veterans, was designed as a representative cross-section of the landscape of veterans’ services. Selecting these organizations from the roughly 45,000 listed in the Guidestar database as serving veterans and their families proved both an art and a science and yielded tremendous insights to the research project. Over the past year, IVMF and GWBI conducted site visits with each organization, spending two days interviewing everyone from presidents and CEOs to front-line programmatic staff who deliver services to veterans and their families every day. Interviews were transcribed, and case studies were written about each organization, resulting in an extensive cross-case analysis report identifying common themes and lessons learned from across the landscape. The final outcome of the research process was three toolkits, one each for nonprofit organizations, funders and veterans themselves, each designed to inform its target population regarding excellence in the field of service delivery. The nonprofit toolkit presents a framework for excellence and a self-assessment tool; the funder toolkit assists funders to tailor their giving strategies to the unique concerns of veterans, including an assessment tool for potential grantees; and the veterans toolkit serves as a roadmap guiding them through the landscape of services and presenting them with a list of questions to ask to ensure they are getting top-notch services and care. The summit served to highlight the yearlong research project and release the outcomes, though the veteran toolkit will be released later this year. Throughout the day, former President Bush spoke with veterans about their transition successes and challenges; panelists discussed how organizations can deliver a successful transition for veterans and what organizations need to do to get there; and experts in the field discussed the importance of collaboration and cooperation at the community level to foster the success of organizations and veterans themselves.